Although lighting and electrical design can be, or should be, intimidating (because if you screw up you can electrocute yourself or burn your house down), there are some important design and planning aspects which a DIY’er can accomplish. These revolve around things like placement and functionality, as opposed to detailed design such as number of circuits, wiring requirements, distribution panels, and component specifications. The detailed design is best left to professionals. Even if you’re SURE you know what you’re doing, you still should get some professional advice. More on that later. First: Lighting Design! Lighting design is important for an age in place home because as you get older, your eyesight diminishes. Besides the inconvenience of fumbling around in the dark for the light switch, older people are endangered by unseen trip hazards. Remember, if you fall when you’re older, you may lose your mobility, and that is a death sentence. Lighting can also be a very aesthetic addition to the home. There are three types of lighting: (1) Ambient (or General) which is used to provide light to a relatively large area, (think garage overhead lighting); (2) Task lighting, which is directed over specific areas where people do work, such as over the stove or kitchen counter: (3) Accent lighting which is used to draw attention to specific areas such as wall wash lighting for a picture display or outdoor foot lights on the sidewalk. Lighting design can get pretty involved, but a good place to start is the American Lighting Association website that has a lot of good resources to investigate. Another good resource is the California Title 24 Residential_Lighting_Design_Guide. This has some nice plan views to help visually show some of the options. A great resource, if you have to deal with California Title 24 lighting requirements, is the UC Davis California Lighting Technology Center (CLTC). Hey, even if you don’t give a rip about Title 24, this is cutting edge stuff. So, I went through the house and imagined where I would want light for going from place to place (general), seeing what I was doing when I was cooking and washing my face (task), and highlighting our family picture wall (accent). I then drew up some plans and did some rendering to see what it might look like (here). A short word on rendering. It takes a bit more effort to understand computer rendering. But if you have a good 3D model, you’re over half-way there. It’s actually pretty cool to see your virtual creation look like a photograph, and it’s possible for not too much $$ if you’re willing to take the effort. Kerkytha render is a free program, but you have to jump back and forth from SketchUp, which for me, is a PITA. A better program is Twilight Render, which at $99 is a real bargain. 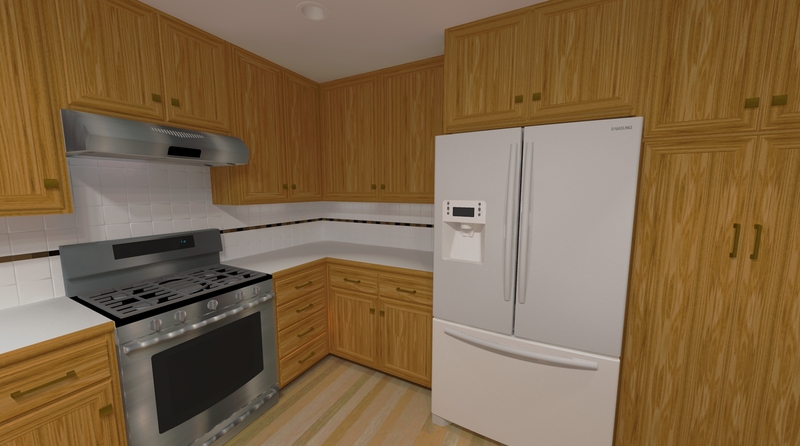 It is integral to SketchUp, and you can produce fantastic photorealistic renders. In any case, I did a few renders and walk-throughs, and came up with a lighting design. Another aspect of lighting design is how you’re going to hook up the lights and control them. You want to be able to control certain lights from specific, convenient locations. Many times, you’ll find that it will make sense to control a group of lights from different locations, such as hall lights with a switch and the beginning and end of the hall so you can turn them on and off as you move through the space. That’s where the electrical hook-up comes into play, and we now are getting down into the nitty-gritty of the electrical design.